You didn’t think I was going to talk all about my time England and NOT blabber on about Harry Potter, did you? Naive Muggle fools! Muahahaha. Traveling through the UK was like walking through the pages of all of my favorite children’s books. I got to visit castles that looked just like Hogwarts, Kensington Gardens (the birthplace of Peter Pan), and even King’s Cross (including the real Platform 9 3/4!). Now that I’m back, I cannot wait to pay these favorite books another visit while imagining them taking place at the very spots where I stood! Knickerbocker glory is probably my favorite single food item from the HP series, immortalized in a line about Dudley throwing a tantrum “because his knickerbocker glory didn’t have enough ice cream on top” (anybody who knows me at all also knows that I love quoting that line in everyday conversations about ice cream). Until I traveled to the UK last month, however, I had never tried the famed treat–which, of course, only hardened my resolution that I would do so in the native land that had popularized it. It wasn’t until our last day in England that the coveted opportunity popped up in York, where we were grabbing dinner after the horse races. 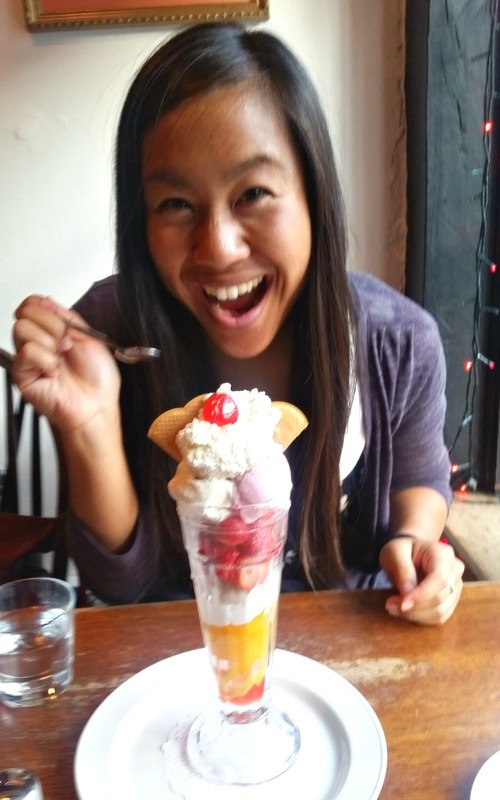 After moseying around town for over an hour perusing our options, we finally settled on a cozy traditional English restaurant that, lo and behold, served knickerbocker glory! Cue hallelujah choruses, because I was seriously excited. Turns out, Knickerbocker is really nothing more than a glorified-sounding ice cream sundae–but because it’s a quintessentially British thing and also sounds super British, I enjoyed every moment of it and immediately added it to the list of things I’d make the moment I got home. And then, because apparently I can’t for the life of me take a photograph of frozen anything without it melting on me faster than I can assemble it, I decided to gif everything so that you could see it in all its molten, melty glory. I decided to layer fresh fruit (strawberries and tangerines) with vanilla ice cream, caramel, whipped cream, and chopped nuts, but the sky is the limit with this British dessert: meringue, custard, and any combo of ice creams and syrups are fair game. And hey, if there’s not enough ice cream for your taste, no need to throw a tantrum, Dudley-kins darlin’: just add to your heart’s content! 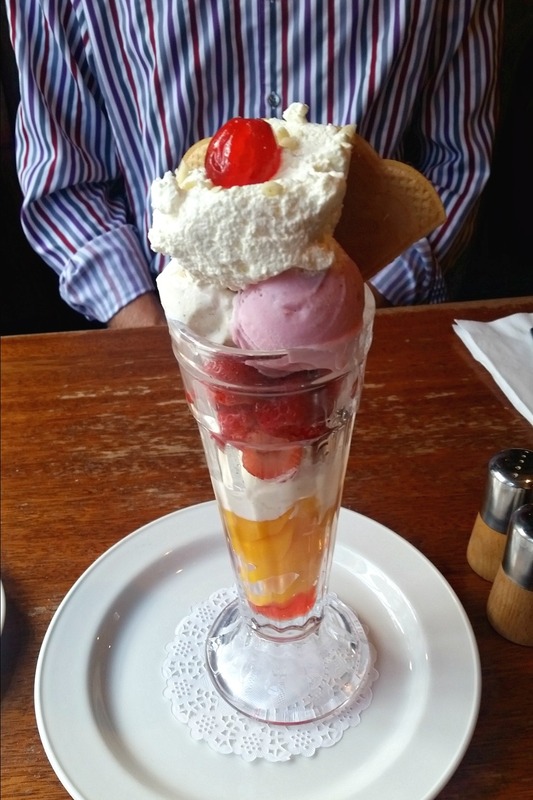 What would be in your ideal Knickerbocker Glory? 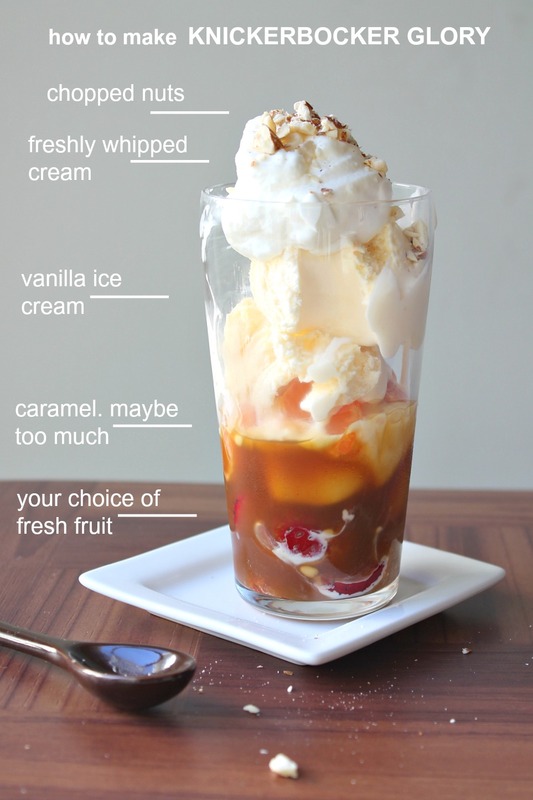 Knickerbocker Glory is a dessert from the UK that celebrates all things ice cream! The best part is that you can customize to your heart's content: fruit, meringues, custards, ice creams, syrups, whipped cream, chopped nuts, and anything else are all fair game. This recipe is for suggestion-only, so experiment away! In a tall glass (this is essential! well, sort of), layer: strawberries, 1 scoop ice cream, orange, caramel sauce, 2 scoops ice cream, whipped cream, chopped nuts. Feel free to add and customize! Other suggestions: meringues, custards, syrups, other fruits & nuts. What a g great treat this would be, especially on a hot day. My husband would love this. Yeah, I bet you both would love it! Thanks, Gerlinde! OMG that sounds sooo good, Liz! So much coma-ing to be had!! What a fun dish! Never had one of these — definitely worth trying. Love the pictures! Thanks. Yes, perfect for the ice cream lover 😉 thanks, John! haha secret lives are the best! It’s kinda a wizard-y thing to lead, right? Hope you get to try these, they’re pretty magical! OMG! This is insane!!!! I WANT ONE! I do remember the line in HP but had no idea was a knickerbocker was. Your post has not only made me very hungry for this, but educated me as to this incredible dessert, snack, breakfast – oh heck – why not just have it for supper. We are truly ice cream kindred spirits!! I would most definitely have this for supper, eeee~! how could i not comment on something with a name like knickerbocker glory?! also, feeling like i need to re-read harry potter now, lol. my dream summer knickerbocker glory would just have alllll the berries ever on there, with almond brittle. and my winter one would have hot fudge and salted caramel and nuts and whipped cream and more brittle. omgosh almond brittle, how did I never think of that?! You are most definitely invited to my next Make-Your-Own-Sundae party, ladyyy! Omg, I didn’t know this was a legit thing! This is hilarious and awesome and I’m so glad you took it upon yourself to recreate.